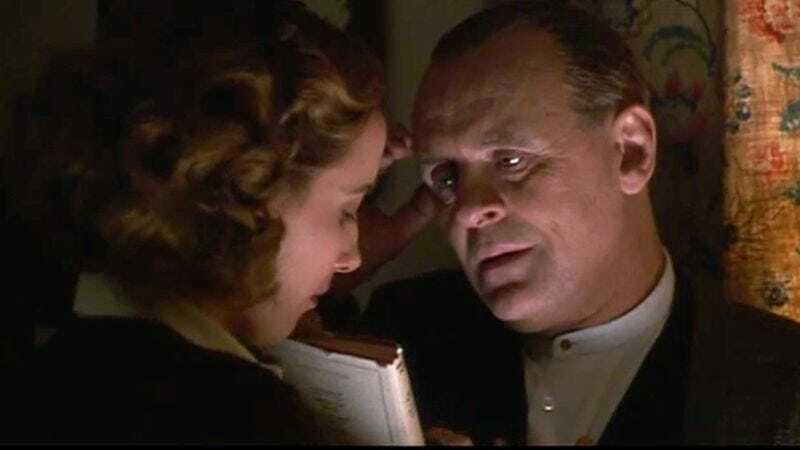 When I saw The Remains of the Day on the list of Movie Anniversaries to pen for MovieBabble, I felt it to be a personal duty of mine to choose it and write about it. After all, I have taught the novel the movie is based on — by Nobel Prize winner Kazuo Ishiguro — for 5 years of my teaching life, trying in vain to explain to the young people in my classroom the poignancy encased in the novel, fleshed out through the exploration of memory and regret. I have never properly watched the movie, merely using clips of it to use in my teaching; only the book existed for me during those 5 years. So today, for the first time, I sat down with a cup of tea, to get into an ‘English’ frame of mind — suitable for a movie such as this, and I watched the film. It is difficult for me to look at the book and movie as two distinct worlds, but I can see why the movie did so well. It is a stunning film, with nice picturesque glimpses into the English countryside, as well as an expansive tour of the grand estates that used to be more prevalent before the second world war. Despite it being released 25 years ago, it doesn’t come across as dated or lacking in currency. Yes, it follows the journey of an English butler, but one doesn’t have to be a butler to get into the movie and enjoy it. At the core of the movie is the discussion of the personal and professional spheres that we balance in our lives, and the detrimental effect it can create when we prioritize one over the other. In society, we thrive on boundaries — what is personal should remain so and the same would apply to the professional. This distinction becomes difficult for servants like Stevens, played by the ever-versatile Sir Anthony Hopkins, in part because they live where they work. If he is always present in the setting where he works, then when can he drop the suit of professionalism and release the more personal side of himself? We never see Stevens allow himself to do this, because he needs to be wearing the butler suit and performing his role at all times. Hence, the more tense moments of the movie revolve around pivotal personal events for Stevens, such as his father’s death and Miss Kenton’s (Dame Emma Thompson) engagement. His father’s death is a huge blow to Stevens, but he needs to continue to work, in part because he believes this is what his father would have wanted him to do — he cannot stop in his performance. A butler who allows personal issues to overwhelm his professional role is perceived to have failed in a notion he terms as “dignity”. Sir Anthony Hopkins does a good job in conveying his character’s inner agony, especially when he has to carry on with service when his father has just passed away. He appears distracted and ill, which is noticed by Sir Reginald Cardinal (Hugh Grant) and Lord Darlington (James Fox). It was a pleasant surprise for me to realize that both Thompson and Grant are in this movie together, especially because 2 years later they would go on to play Elinor and Edward in Sense and Sensibility. It is also weird at the same time since Thompson has a romantic entanglement with Hopkins in this movie, and Grant looks so young in comparison. Stevens is also unable to articulate his affection for Miss Kenton within the professional space. When he talks about her importance to him, he is quick to associate it with the professional qualities she brings to her role as housekeeper, pushing away the romantic implication, despite what he feels. The tension culminates in what we label ‘the pantry scene’, where Miss Kenton teases Stevens about reading a racy book. There is nothing racy about the book, but it is sentimental love story, which is not in keeping with the image Stevens needs to preserve for himself. Both Hopkins and Thompson are splendid in this scene, their body language, the way they look at each other; there is so much yearning – which is frustrating for the audience. Why doesn’t he just kiss her? Or make a move? He can’t. The only real thing for him is his profession, he has worked so long and so hard that he cannot allow himself to push it aside to take what his heart wants. This is the regret that he has to deal with later on in the movie — his life could have had more to it if not for the limits he imposed upon it. There are a lot of moments in the movie where we see vestiges of the past glimpsed in the present, only to fade away. This is due in part to the way the movie is structured, an interspersing of before and after the war, and how the war has changed the cultural and political landscape of England. In the present there is the dominance of real politics — as manifested by Mr. Harry Smith, and the fading of relevancy of the aristocratic mark. This is also seen in how Darlington Hall now has an American owner (Christopher Reeve) and the dilution of Stevens’ butler role. Before, Stevens had a large staff of servants at his disposal and command, now he works with only a small handful of servants. There aren’t any more large gatherings to prepare for, with Stevens mainly tending to Mr Lewis, the American who bought Darlington Hall. This is especially difficult for Stevens to deal with, since he had invested so much into his role as a butler, only for it to culminate in such meaninglessness. He cannot even say that he served a gentleman of high moral stature, since Lord Darlington is viewed as a Nazi sympathizer, and as well-meaning as he is, did order Stevens to fire two Jewish maids because of their ethnicity. For a lot of us, our jobs are a great contributor to our identity and who we are. It cannot be an easy thing to have dedicated your life to something you believed to be worthwhile, only to realise that you have nothing to show for it. Also, as we age, there is a fear of being unwanted and unproductive. We see this fear in Stevens’ father, who could not accept that he would not be allowed to do tasks he had been doing for most of his life — all because of a fall. There is such sadness in watching him walk back and forth at the area where he tripped, trying to prove that there is nothing wrong with him, in a sense working to regain what is already lost. The movie moves effortlessly between past and present, using the letters Stevens and Miss Kenton write to each other as a means to venture back. In the later part of the movie, an experience is used instead, where Stevens’ interaction with a Dr. Richard Carlisle in Moscombe reminds him of the similar emotions he felt in the past during his conversation with Mr Spencer. While Dr Carlisle is nicer and more pleasant than Mr Spencer, both these interactions remind us of the social immobility that still exists even in post-war England. Even though democracy now pervades the landscape, there is still a difference between a gentleman like Dr. Carlisle and a servant like Stevens. No matter how much Stevens carries himself as a gentleman, in manners and speech, there is always going to be something about him that distinguishes him as a servant. It is a sad realization as Stevens is no longer able to be the butler he once was in Darlington Hall, and now on top of that, he has no sense of identity and purpose in the outside world. All that is left is the path that his father walked, to work until death. It is worse for Stevens because he has no one to grieve for him once he is gone, due to the personal relationships he chose to forego in the maintenance of his professional sphere. What I wished they included more is the journey aspect that is so prevalent in the book, for it is the journey that triggers all these delvings into the past for Stevens. But I suppose there was no room for this seeing as how the movie is already 2 hours long, anything more and it might rival the duration Avengers 4 is reported to have (3 hours). Having watched the movie, I can say it is a wonderful companion to the novel. It faithfully captures the main themes and the actors do an amazing job of conveying the characteristics of their fictional counterparts. But if you have the time, I would encourage you to read the book. Ishiguro is a master at what he does, which makes his award of the Nobel Prize in Literature in 2017 no surprise to those who have read any of his books. The Remains of the Day is a painful read, since it focuses so much on the bleakness of our human lives. We do so much in order to be significant, but in that lies so much futility. This is the case for all the characters. Stevens never got to achieve his sense of dignity, Miss Kenton had to settle for a married life with a man she did not love because she was afraid of loneliness, and Lord Darlington devoted himself to a cause he thought to be worthy only to end up on the wrong side of History. I write and I teach because I want to be a part of something that matters, but I do wonder if at the end of the day, maybe all I will be left with is a “heart [that is] breaking”. Thanks for reading! What are your thoughts on The Remains of the Day? Comment down below! Brian, thank you so much for your lovely comment! You have left me utterly speechless, which is not a good look for a writer but honestly, I so appreciate your words 🙂 I recently got shortlisted for a writing gig that I really wanted, then I got the news a few days ago that I didn’t get it. I’m sure you know how hard it is sometimes to write. It is an endeavour that requires so much confidence yet breeds such insecurity. Your comment has really brightened my day. Thank you so much again! Your most welcome. I’m sorry you didn’t get the job. I write as a hobby but I’m driven to become a better writer. I spent the day revising a post I published before spending the proper time with it and became disheartened when a rush of visitors showed up during the process. It must have looked like they walked into an operating room mid surgery when the patient was still flayed open with their organs scattered about. Knowing I made you feel better makes me feel better. That’s what’s great about WordPress. It gives writers a chance to communicate with each other and encourage each other. I’m sure you’ll find a better gig than the one you didn’t get. Thank you for your reply and good luck. I’m not sure if I’ve heard of this film before? You might have heard of the book more than the movie. The news was everywhere when he won the Nobel Prize last year. It’s not the most known movie, but the book was such an important part of my life that I figured I needed to write about it. That’s the beauty of true Art, eh? Awwww! Same here dude. When did you watch it? I saw it for the first time a few years ago and was instantly smitten. A newcomer like me! I would really recommend the book, or another movie that was based on an Ishiguro book “Never Let Me Go”. Several friends and I saw this movie in the theater when it first came out. We all put on sunglasses upon leaving the theater to go to dinner to hide eyes red from crying. Natasha, as a fellow writer and teacher, I urge you to take heart in the belief that what we do matters, even when we can’t see the direct evidence of it ourselves and our hearts are breaking. Oh Liz, thank you so much for your lovely words. I always look forward to reading your comments on my posts. I must admit that I teared a little reading that. It has been a difficult year for me as a teacher, and your words really helped put things in perspective for me.